Yeah, that’s what I did – nothing; I slept like an infant, ate like a wolf and trekked with wanderlust. Nestled in oak and pine forests, Barog is a pristine hill station on the Kalka-Shimla highway. It’s about half-an-hour drive from Kasauli, another short holiday destination. Did you know a British engineer, whose name was Barog, committed suicide here? Here’s his incredulous story: He was incharge of building the Barog tunnel, the longest on the Kalka-Shimla railway track, which is now a World Heritage Site. Due to a railway alignment error, he was fined a rupee. Unable to bear the shame, he shot himself during a walk with his dog. Buried close to the Barog station, his grave – like his story – seems to have been lost in obscurity. But Barog, named after the unfortunate man, is anything but spooky. Standing in the vicinity of where the engineer might have been laid to rest, the Scottish style station offers the perfect sundown view of the hills. During the walk back to the “main” Barog road, you hear the sound of silence, amplified by cold winds. 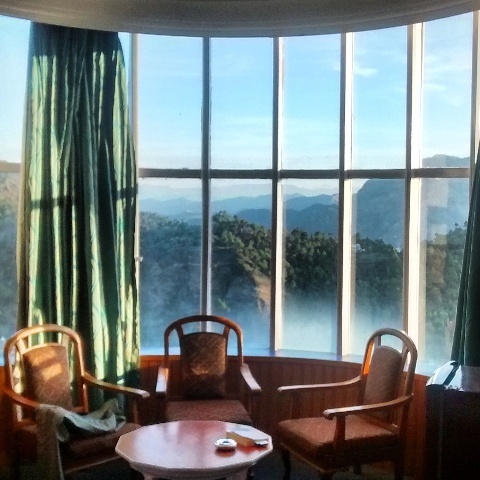 There are little or no tourists either in this little unknown outpost in Himachal Pradesh. After a quick breakfast we walked again, this time to the top of a hill to visit a campsite run by retired faujis. And then time stopped for a good forty minutes as we beheld a spectacular view. Ferocious winds blew right in our faces, making sounds in concentric circles. Wrapped up in woolen caps, mufflers and hoods, we sat there, not speaking to each other. Sometime later, we returned to our principal obsession – eating, at the beautiful and very warm Pinewood Café, run by the state as part of its big hotel there. I distinctly remember the smell of food. Poori aloo, sandwiches, omelets, cutlets. Like many (but not all) state-run properties, Hotel Pinewood felt homely and warmer than Barog Heights, a walk through the premises revealed. We decided to have lunch there, which was so good, we skipped dinner. Well, almost. On our way back, we spent some time in Kasauli. After taking in a panoramic view of the plains, including Chandigarh’s Sukna Lake, from the top of a Hanuman temple, it was time to hang out at the mall road. 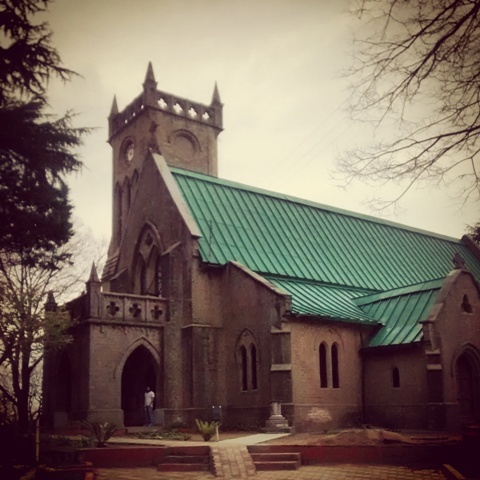 To get a taste of the British-era architecture, walk into a 19th century church that leads to a short mall road. At the end of the bazaar, try pickles made of meat. And definitely stop by at a photo studio which has pictures of India’s famous people – from the world of films, sports, politics – to its credit. Braving a troop of menacing monkeys, we gorged on desi Chinese food from a kiosk that gave other eateries a run for their money at the mall. It was time to go back, to routine, agendas, alarm clocks and a life that rarely gives the opportunity to look up and notice the sky. Sounds like a nice place to visit to get away from Delhi. Sad that Barog killed himself in such a beautiful place. Sounds like a really nice place to visit. Sad that Barog killed himself in such a beautiful place. On my list of places to visit soon.